25 Heavyweight note cards & plain envelopes, personalized in a fun handwriting typestyle, come packaged in an attractive gift box. Please specify ink color and a top line and (0ptional) bottom line. Optional return address on envelope available in matching ink color and typestyle for an additonal charge. Flat card measures 5 1/2″ x 4 1/4″. Please enter exactly as you wish it to appear. Entry is Case Sensitive. 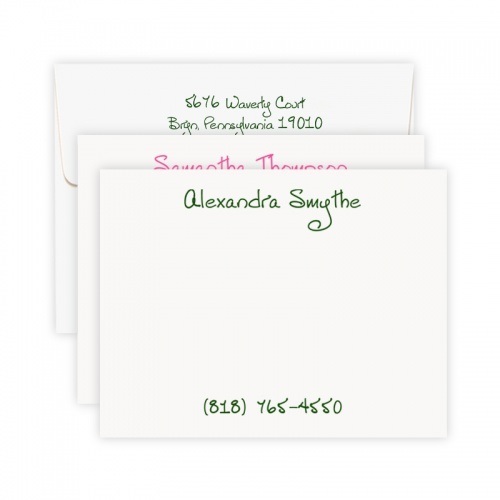 All monogrammed note cards are custom made especially for you. They may not be returned. Please allow 2 weeks for delivery of this item.